Wireless battery powered 6" LED lights perfect for illuminating centerpieces, flowers, vases, or using underneath tables. Charge these up in advance of your event using the provided USB cables or 3 AA batteries. NOTE: batteries not included. We've got plenty of USB cables to loan you, but you'll need something to plug that into a wall, or you can charge from your computer's USB ports. Please allow up to 5 hours for charging. If fully charged, the internal batteries will last approximately 8 hours or 5 hours on AA batteries. Battery time is approximate and varies based on color, if using a pattern, etc. Just like your laptop and computer batteries, its pretty impossible to give you an exact amount of time the batteries will last, so its strongly recommended to just bring some extra AA batteries to your event. 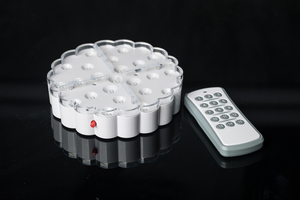 Using the provided remote control, you can choose from any of the 13 fixed colors, or instead set them to all change colors together in a slow fade pattern. 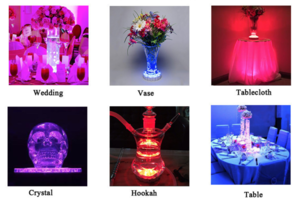 You'll want to rent 1 fixture for every vase or table you want to light. Highly recommended to order a couple more than you think you need just in case you have any problems, or decide you need a little more effect. For example, if you have 20 tables, and you want to light 20 centerpieces, then maybe order 22-24 to have a few extra available.